Free Shipping On Your Order From Bowflex Direct! Use Promo Code FREE14A at Checkout - Limited Time Offer! 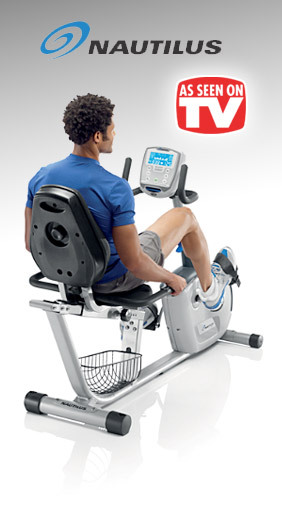 Nautilus R514 Recumbent Bike is just what you need to get a vigorous and effective cardio workout. Its innovative design and extensive features assure that you’ll get the fitness results that you’re looking for. Get ready to ride in comfort with the Nautilus U514 upright bike. It features an extensively researched ergonomic design which makes it much more comfortable to ride than typical exercise bicycles. The result is that you can ride longer and more vigorously and get into shape at an accelerated rate. The Nautilus R514 is just what you’re looking for if you desire an effective and energizing cardio workout coupled with a comfortable riding experience. The advanced ergonomics and innovative design of the R514 allow you to ride longer and harder than you can on a typical exercise bicycles. 16 levels of resistance, 17 workout programs and 7 profile courses ensure that the R514 recumbent bike is always ready to provide you with a challenge. Get ready to take your workout routine to the next level by complementing it with the vigorous cardio workout that the R514 so effectively provides. You will be amazed at the new dimensions that the Nautilus R514 recumbent exercise bike will add to your fitness routine. The Nautilus R514 Recumbent Bike is backed by an exceptional warranty – 10 years on frame, 2 years on mechanical, 1 year on electric, and 6 months on wear parts. The Nautilus R514 Recumbent Bike is a superior product, and Bowflex stands behind each and every one. Your satisfaction is guaranteed! Just purchase your machine (direct from Bowflex) and workout for up to six weeks. If you’re not 100% satisfied with the results, simply contact their customer service department for a Return Authorization, return the machine (including any accessories) in its original condition and packaging to receive a full refund, less shipping & handling. Item must be received no later than 2 weeks after your return authorization is given. * The above guarantee is for purchases made through Bowflex only. Be sure to check the current return policy of all retail partners presented on TVgyms.com for the most up-to-date information. What more could you want? Order the Nautilus R514 recumbent bike right now and start seeing results from the most rewarding workout you will ever have.